If you haven’t got any plans for Saturday — or even if you do — check out Dine and Jam. Dine and Jam is a monthly celebration of the love of music, gift of cooking and joy of friendships. Each month will feature home cooked pasta meals from the Regali Kitchen, and amazing talent courtesy of Tim 4:12 productions. It’s actually a family project of ours. Papa is basically the owner (Mama and Kuya JB are the managers). Kuya JB is the head chef of the Regali Kitchen, which provide the scrumptious dinner. Mama is the queen of desserts in the Kitchen. Kuya Ace is our graphic designer for tickets and posters and such. 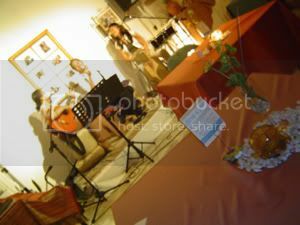 Kuya Tim heads 1 Tim 4:12 productions, which provide live, relaxing, cool jazz music while you eat. And moi? I handle marketing, guest relations, finances, and all that jazz. What’s so cool about D&J; is that it’s not just a restaurant. It’s not just a gig. It’s one big party where family friends share good, clean (and delicious!) fun. And it’s even more fun because our friends become friends with each other. Like, my friends become friends with Kuya Tim’s friends, Kuya JB’s friends’ parents become friends with my folks, etc. It’s sort of like friendster in real, non-cyberspace life. Try it sometime (and I recommend this Saturday), and I’m sure you’ll have so much fun, you’d wish it happened every week.